I love beer. There, I’ve said it. It’s out in the open now. You know it and I know it. I can now write this post without restraint. I like all kinds of beers. I like ales and lagers; stouts, porters and pales; import and micro; light and dark; imperial, dubbel and tripel; lambic, gueuze and fruit. I was able to taste many of these different kinds recently. 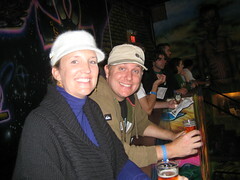 On Saturday night Mel and I attended the San Diego Brewers Guild Beer Festival at the Balboa Park World Beat Center. The festival is a non-profit event benefiting the Brewers Guild and the Beat Center music program. Thanks to a friend’s recommendation we purchased the VIP tickets, and boy were we glad we did. The VIP tasting was from 5-7 and was significantly less crowded and had some special beers available. 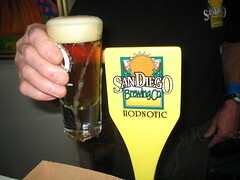 San Diego has a world renowned group of local breweries. While San Diego and the West Coast in general are known for our strong IPA style ales (my personal favorites) most breweries are branching out into many different styles and experimenting with lots of different ingredients. We sampled many of those different beers. Below is a list of beers we tasted during the 3 hours we were there. I certainly wasn’t taking tasting notes, but I can say that each beer was excellently made. I highly recommend the Brewers Guild Festival and specifically the VIP session next year to any San Diego beer fans. This entry was posted in Fun and tagged beer by Flash. Bookmark the permalink. i’m still upset i didn’t get to go.